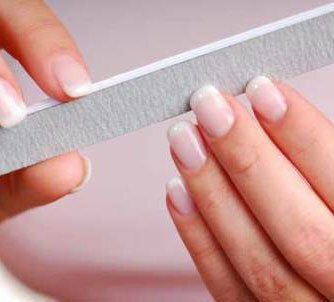 "When do natural nails filing, absolute don’t use metal file because it will cause damage to the nail, the file type from 220 grit or higher is best. Remember to do one way filing to avoid hot nail and dissatisfied. The remaining operations of nails filing do as normal". Guests easily complain on problems can occur when doing acrylic nails is nail peeling or being pushed up phenomenon. Prevention solution (apart from the usual way) is use cosmetics to help maximize adhesion between powders and nail foundation, they are available at your local beauty supply nails. Many experienced manicurist often have these cosmetic for technical support to perfect their nail technique. 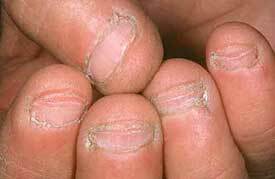 There are customers keeping complain on manicurist after their nails done, because of the phenomenon of the nail grows into the skin puncture living in pain. 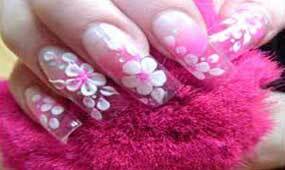 Here is a nail technician experience of Loan N, Carson, California: "This can happen because of the technical failure when manicure. First of all, these guests often have large size feet, so you should use large size clipper. Remember 2 things when cutting: first, do not let nails head too bent that easily cause the nail grows into the skin; second, only left nails a little longer than toes tip, absolutely not cut too short. Other cutting operations do as normal". 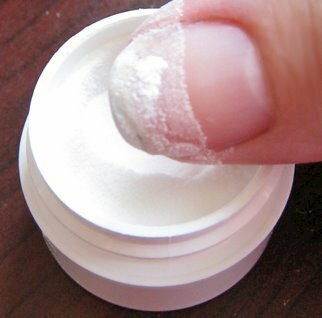 • Remember to clean nails thoroughly before apply next layer. • Advising customers to add gloss paint every few days at home to protect the paint color. • The most effective way is use the specialized cosmetics on market that have paint color lasting retention effects. • Use specialized cosmetics and nail polish available in nail beauty supply. This happened at the salons, from the experience of PT Nina, North Atlanta, is to apply special synthetic medicinal or liquid foundation cosmetic on nails, this type of foundation will create a solid firm that keep nail of customers from bleeding and infection, all of which have to have very good hemostatic effect, you should look at the beauty supply in the area to buy in case of consecutive use. A manicurist good at nail corner taken and do not hurt customers would be trusted and strive to make an appointment to be served. Experience in this job , Monique H, a manicurist form Hesperia, California, said: "At first you have to massage the skin with specialized oil or softened cream, use proper cosmetic to wash the epidermis wound if any, and carefully remove skin pieces nail stuck in the nail corner. You also can use plastic tweezers to pick up the scraps of skin, smooth and gentle, to satisfy the customers"